What do you do when you have a toothache with braces? It can be a major cause of concern. If you have a toothache with braces, it can be difficult to know whether to call your dentist or orthodontist. Some type of discomfort is normal when you have braces. But, there is a significant difference in the degree of pain you experience when you have a toothache with braces. Who Do You Call for a Toothache with Braces? Once you start your orthodontic treatment, chances are you will see your orthodontist far more than you see your dentist. So, who should you call when you have a toothache with braces? As your braces move your teeth to their ideal positions, you might experience some initial pain and discomfort in your mouth. This is completely normal. But, if you experience a toothache with braces, you need to seek further attention. If you feel your pain is not the normal discomfort associated with your braces, it’s important to contact your orthodontist. They will be able to analyze your mouth and decide whether its your orthodontic treatment or some other sort of medical issue, like a sinus infection. But, if your toothaches are caused by a cavity or injury to your tooth, your orthodontist will have you call your dentist to make an appointment. Dealing with a toothache at any time can be a real pain, literally. But, dealing with a toothache with braces can be particularly difficult. If you have a toothache with braces, you should ask your dentist or orthodontist about what type of pain relief they would suggest. In most cases, you can take a simple over-the-counter pain reliever such as aspirin or ibuprofen. Other pain relief options include cold, wet compresses. These should be applied to the outside of your mouth by resting them on your cheek. The cold will help reduce the swelling and inflammation that might be adding to your discomfort. If you can’t get into the dentist right away, it might be necessary for you to make some behavioral changes to get additional relief. 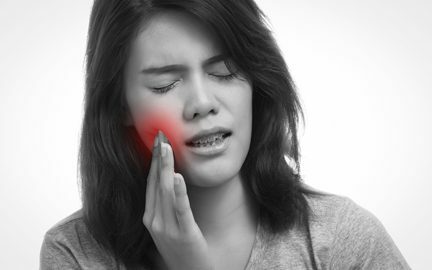 Eating foods that are hard, chewy, or spicy can add to your discomfort when you have a toothache with braces. You should also avoid foods that are very hot or very cold, because they could add to tooth sensitivity. Anything that is extreme should be avoided. The best option to keep your pain at a level that is bearable is to stick to soft, bland foods. It is definitely an unwanted issue to have a toothache with braces. But, the good news is that your orthodontist and dentist will work as quickly as possible to resolve your issue. While some types of toothache with braces is normal, it’s important to call your orthodontist if you think there may be an underlying issue. You’re working hard to get that perfect smile, don’t let anything get in your way!